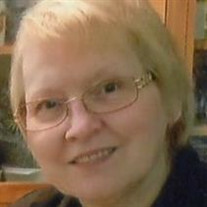 Judith Ray (Bucklew) Shreve, age 68, of Petersburg, WV passed away on Tuesday, November 7, 2017 at her residence. She was born May 5, 1949 in Morgantown, WV and was a daughter of the late Donald Ray Bucklew and Ellen Marie (Sterling) Bucklew. Mrs. Shreve retired from Work Force West Virginia, Employment Programs Enterviewer II with South Branch Job Service. She is survived by her husband, Douglas L. Shreve; her son, Travis M. (Debbie) Turner of Bruceton Mills, WV and her daughter, Toni Ray (John) DeWitt of Morgantown, WV; five grandchildren and 8 great grandchildren; her sister, Jill Burgess of Morgantown, WV and two brothers, Dean (Debbie) Bucklew of Morgantown, WV and Steve (Patty) Bucklew, of Morgantown, WV. According to Mrs. Shreve's wishes, her body will be cremated and all services will be private.